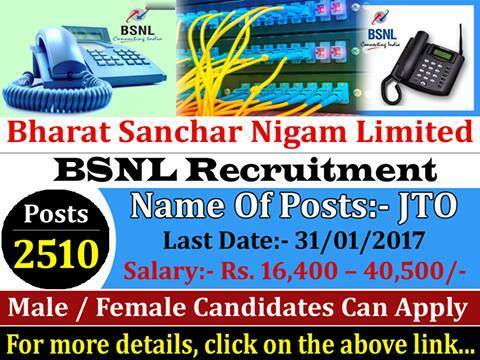 Are you searching for bsnl company jobs? They are hiring for freshers and experienced candidates. Now check below. Bharat Sanchar Nigam Limited is the India’s largest telecommunication network and it is wholly owned by government of India. BSNL headquartered at New Delhi. We know it’s having large number of branch wise offices in each state. Whenever they need manpower, it releases notifications to recruit young and talented people for the smooth run of organization. Bharat Sanchar Nigam Limited Offers various plans and schemes to attract customers and provides better facilities. For that it needed Direct Selling Agents (DSA) in Uttar Pradesh state. So, it has released the BSNL Direct Selling Agent Recruitment 2016 notification for nearly 10,000 vacancies (tentative). Go to the recruitment advertisement link.